The annual Black Santa Christmas Appeal sit-out has ended with the “goodwill and generosity” of the public being praised by the senior cleric. 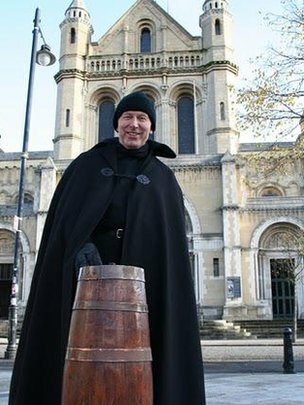 The Dean of St Anne’s cathedral, the Very Rev John Mann, has been collecting money for charity on the steps of the building since December 15. Last year £185,000 was raised but he said despite the difficult financial times, he hopes to raise £200,000. Nearly 200 charities are seeking help this year. The appeal raises money for local charities as well as Christian Aid. “I think the important thing to remember is the charities are also going though difficult times and I’m particularly conscious of the smaller charities,” Rev Mann added. Rev Mann was assisted in his sit-out by the bishops of Down and Connor, and Dromore as well as the cathedral canons. He said they have been “humbled” by the generosity of the public. The vigil started in 1976 under Dean Sammy Crooks and has raised millions of pounds for charity since then.